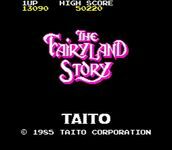 "The Fairyland Story is a classical arcade platform video game released by Taito in 1985 in its arcade form. The game has two known conversions, to the MSX and X68000 computer families. The game itself was not a great success compared to more famous Taito games such as Bubble Bobble or Rainbow Islands, but it can be considered to be one of the ancestors in the popular Bubble Bobble series of video games. Many of Bubble Bobble's gameplay elements and even some graphics and bonuses first appeared in Fairyland Story, and Ptolemy appears as a bonus in Bubble Symphony." Source: Wikipedia, Fairyland Story , available under the CC-BY-SA License.